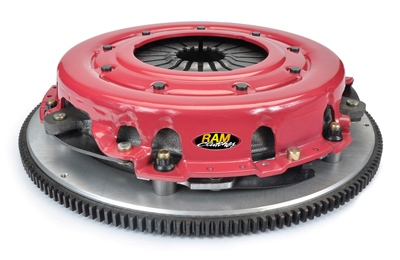 * Billet Aluminum Flywheel These RAM Force 10.5 twin-plate clutch kits have a strap-driven assembly that quietly transmits in excess of 950 ft.-lbs of torque. They are available with your choice of a 300 Series steel-backed friction disc or a 900 Series sintered iron disc. The kits use a marcel spring--a thin, wavy device that helps to eliminate the go-or-no-go tendency that similar dual disc clutches have. RAM Force 10.5 twin-plate clutch kits include a billet aluminum, SFI-certified flywheel with a steel insert that has sufficient mass to draw heat away from the clutch without distortion. Our Quality & Finish will leave you with a grin from ear to ear as it is the Best looking unit available for your Ford Mustang or Cobra. Quality Construction: No one else gives you the bold clean styling of our Aftermarket Dress Ups, Suspension and Performance Parts for your American Muscle Car like UPR Products! Click Here for Instructions Fits these Vehicles: 2011 2012 2013 5.0L Coyote V8 GT Mustang Roush & Saleen Vehicles. Made in the USA!